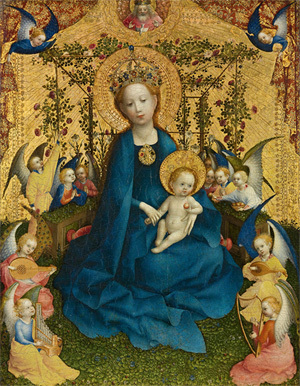 O Flower of flowers, Our Lady of the May! With white Saints kneeling round. We give thee the fresh flower-time of the earth. Spirits of gracious rain and light and dew. Bright beneath skies of blue. Let thy soul's grace steal gently over ours. Nor wither in the dry and parching dust. Star of our hope and trust! Immaculate amid death's house of gloom. Not only for ourselves we plead, God's Flower! Lost in this pleasant land, thy chosen Dower! And England from her long, cold winter wake. Thérèse, M. I Sing of a Maiden: The Mary Book of Verse. New York: Macmillan, 1947. To make our Queen a crown. When laid within her hair. The whiteness of her hands. When brought before her feet. Was sordid as the street. Like plants who knew not rains. Who fall with bursting veins. Whose jewels were some straw. From homely strands of hay. Robert, Cyril. Our Lady's Praise in Poetry. New York: Marist Press, 1944. And music from babbling streams. Those were the Mays of old. With fire fairies for light. That's where I used to go. Till the night of her fairies was done. Till the rose-colored dawn of day. And her cheeks are the petals of a rose. And they carry Life wherever she goes. And her wreath is the coronet of May. Is a Bud from the Triune Bouquet. She is Mary full of grace. She is Queen of Eternal May. Dropped from the looms of May. Slim lilies leaned to touch her gown. Gentle, and full of grace. Robert, Cyril. Mary Immaculate: God's Mother and Mine. New York: Marist Press, 1946. Oh, hear and help us, Lady of the May! And from our lives all discords harsh efface! Responsive to the Godhead's quickening grace! To thy dear Son, O Lady of the May! And glistening insects dart and blare. Sweet springtime blossoms far and wide. To garnish earth with tender care. With a feasting in her honor? And fragrance as a prayer. –F.H.W., Columbia Journal. May 1954. When flowers such loveliness bring? Whose Son is our Savior and King. That lilies are sisters of snow? When beauty and loveliness flow. What, then, is this season, O mother! When fragrance grows vocal in rain? Madonna of bliss and of pain. Let us form, then, for Mary, O mother! Our own little pageant of white. Earth's fairest, and Heaven's delight! – J. Corson Miller, The Magnificat, volume LXX, number 1, May, 1942. – Helen Maring, The Magnificat, volume LXVIII, number 1, May, 1941. I saw a Child at play. And nested at His cheek. And wove them in a wreath. Her mantle was deep blue. Helen Connolly, The Magnificat, volume LXVI, number 1, May, 1940. Knowing that May is Mary's month is easy. Is Mary, then, part of this elemental fury? when hearts are heavy, when sorrow confuses us. – Naomi Burton, The Church World, May 5, 1980. I will twine a wreath of flowers. My poor, yet loving heart. One day in heaven above. Long to see her face. Carnations recall thy Son's deep love. – Anonymous, The Christian Family, May, 1950. Remember the days when thou walkedst beneath them. The bells of all lands ring out for thee. The sacred waters of thy fair graces. That kindles love in the hearts of men. Of joy and salvation, of hope and peace. A sign that shall nevermore be erased. – Anonymous, The Christian Family and Our Missions, May, 1950. Whose mother hands spread only blessing. Sparkling like gold and the hue of the crocus. Dost thou watch the lamps that burn at thy grottoes? Dost thou hark to the chorus that swells through the ages? Royal priestess descended from Abraham and David? Chosen from all eternity queen rose of the world? That this generation, too, will call thee blessed. And His Anointed, thy own divine Son. And asked for prayer and penance at Fatima's cave. Silence the hiss of the ugly serpent. Queen of May! Queen of May! that thrive so boldly where they will. may soothe anew my spirit. Long to do homage at thy feet. 'there is no charity like thine. That soon they may win paradise. Ah! bear them upward, while "We pray"
Sweet Mother, Mary, Queen of May. Silver reeds pipe soft and low. To honor her we spread. '0 heavenly Queen of May, for thee. O heavenly Queen of May, for thee. Our Lady's month of May. In Mary's month of May. And sin, a heavy doom. The sweetest and the best. Queen of May and love's requisite . Our hearts all attuned to the thine? That to Mary must ever be sweet. From hillside and meadow and glen. lf our hearts only love as of yore. Reigns fondly over lands and seas.